Director Ruben Fleischer’s “Venom” has not debuted well with critics, standing at 30 percent on Rotten Tomatoes, and their concerns regarding the film are somewhat valid. It has several scripting, editing and technical issues that weaken its story and make the viewing experience difficult and somewhat tedious. However, it is a fun romp that, overall, I enjoyed watching for its disturbing humor and character interactions. Made in association with Marvel Entertainment, “Venom” tells the story of investigative journalist Eddie Brock (Tom Hardy), whose life takes a strange turn when a carnivorous alien parasite called a “symbiote” attacks him and forces itself into his body. Coming together to form Venom, the symbiote and Brock use their superhuman abilities to confront the corrupt dealings of the Life Foundation, a scientific research company run by the sinister Carlton Drake (Riz Ahmed). Part body horror, part dark comedy, part buddy cop action flick, “Venom” had great potential, but it suffers from an extreme confusion of identity, poor editing and a jumbled script. There is a lot to like about “Venom.” The characterization of Brock and his alien counterpart, and Hardy’s portrayal of the two, are the film’s biggest positives. The dialogue between Brock and the Venom symbiote is entertaining and touching, with some of the most fun and impactful moments of the movie being when the two bond emotionally. Hardy excellently plays the role of a typical, kind-hearted guy who is suddenly forced to share a brain with an alien creature with odd tastes in food and unconventional ideas of right and wrong. The movie also does a strangely good job of convincing the viewer to accept murder, cannibalism and, most bizarre of all, the camaraderie between Brock and the Venom symbiote as Hardy literally plays off himself in his performance. The film’s special effects worked for me, though I may be in the minority on this. 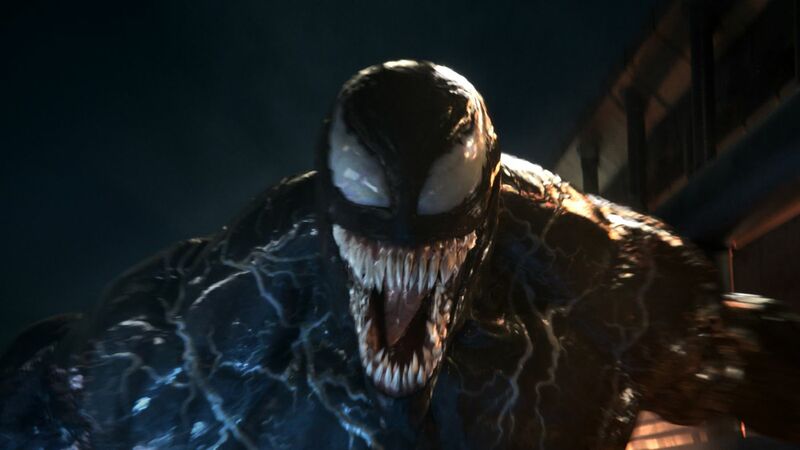 The action sequences themselves needed some work — they mostly read as brief and generic — but the symbiotes are all animated well and the filmmakers put a great amount of care and effort toward giving them creative things to do: multitasking as they shoot multiple tendrils out of their hosts’ bodies, tangling together like masses of goop and encompassing different parts of a host body at different times. Much of the animation is creative and fun to watch. However, these highlights aren’t enough to save the movie. “Venom,” in concept alone, is a hard property to deal with, as Sony announced during production that the film would strip away the context of its comic book history, in particular by removing its ties to the character Spider-Man, a long-time antagonist of Venom. But, at the same time, the filmmakers would attempt to retain just enough of a connection to the comic’s origins so as to satisfy disappointed fans and likely set up future crossovers with studios like Marvel. And while Sony’s efforts are admirable, the struggle of straddling between these two separate visions for the film — one inspired by the classic Marvel comics and one distinctly original — makes for a disjointed and baffling experience. “Venom” is plagued by rapid shifts in tone. Sometimes the movie seems like a black comedy, playing upon the anti-hero’s classic insane, oddball personality from the comics; at other times, it seems like a body horror film, heavy on gore and gross imagery as human bodies are destroyed or perverted by the symbiotes. However, in every version of “Venom’s” identity, the film is put through a “Marvel filter” — the gore is toned down to retain a PG-13 rating, and many of the jokes fall flat or seem unintentionally funny because they don’t fit with a given scene’s tone. As a result, “Venom” comes across as a film that does not know what it is, or what it should be. This confusion over what the movie was intended to be may contribute to the inherent problems with the movie’s screenplay and editing. Watching the movie gave me the impression that much of the film was removed in the final cut, or was refilmed to fit the tonal shifts. That did not help the viewing experience. As I mentioned earlier, the action is brief and mostly unimpressive. There are only three major set pieces, and they all end too quickly, have uninspired choreography and incorporate poor lighting that don’t complement the black mass of goop that is Venom. Furthermore, the film’s lightning fast pace leads to some glaring flaws. Random plot points are brought up without proper resolutions, humorous lines and actions are carelessly injected into tense or serious situations and characters rapidly change motivations off screen. The script is fundamentally flawed — a tangled mess that leaves the foundation for the final product unstable and laughable. “Venom,” at its heart, is a sad case simply because of how confused it is. It’s fun to watch — the action can be entertaining, most of the performances are at least adequate (and at times impressive) and the relationship between Venom’s two halves is legitimately well-executed. These positives alone are enough to recommend watching it and collecting your own thoughts on this bizarre collection of footage. There is something interesting in each aspect of “Venom,” from its disturbing imagery to its comedy, but this film still lacks quality. At its core, the film is a poorly cut, awkwardly written, ill-conceived catastrophe. It’s a wreck I can’t help but admire for the risks the filmmakers took while making it — and the potential it had from its conception.